Don’t throw that broccoli stalk away just yet! When cooking with fresh vegetables, it is common to discard the leaves, skins and stalks. By throwing out those pieces, you may miss opportunities to add flavor and nutrition to your meals, while also wasting food. According to the USDA, about 90 billion pounds of edible food goes uneaten each year. The USDA also reports that food waste is estimated to be between 30 and 40 percent of the food supply in the United States. Cooking in a root-to-stem fashion can help cut down on food waste and lead to eating for wellness rather than convenience. We’ve got some tips to help you get the most out of your vegetables! One of the easiest ways to use vegetable peels and skins is to toss them into a pot of water to create a tasty stock. 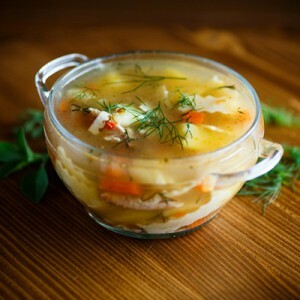 Vegetable stocks are great additions to soups and sauces. Store and freeze vegetables until you have enough to fill a 5-quart pot. For stock, the vegetable-to-water ratio can vary, but in general use two parts water to one-part vegetables. Use carrot tops, the green leafy parts of leeks and scallions, cores of cabbage and cauliflower and/or other leftover parts of vegetables to make a stock. Add water, herbs and garlic to the veggies and let simmer for about an hour. Strain and your stock is complete! Vegetable stocks can be stored in the refrigerator for up to five days. We’ve broken down the vegetables you can eat from root to stem and how to use each part when cooking. Utilizing the full vegetable adds a depth of flavor to your dish! Greens: Think bigger than just leaves! Chop and sauté the stems alongside vegetable leaves to create a crunch to your leafy dish. This includes, but isn’t limited to, Swiss chard, kale and collard greens. Try your stems in this Rustic Pasta and Salmon Sauté recipe! Beets: It’s true, you can use the roots of beets in your dish! Serve the roots of beets by roasting them. Beet roots are the sweetest part of the vegetable and who doesn’t enjoy a little extra sweetness? Not sure how to roast beets? Check out our blog all about beets. Celery: From the root to stem, every portion of celery is edible! While the vegetable is commonly used in soups and salads, mix it up and peel the stalks to your liking or toss the leaves in smoothies and juices. Since the whole vegetable is safe to eat why not eat up as much of the vegetable as possible? We like using our celery pieces in our Crunchy Cranberry Waldorf Salad. Carrots: Not all carrots have green tops, but if yours do then don’t throw them out just yet! Add to a dish for extra depth and flavor. *Warning: carrot greens might have a stronger taste, so try a small amount first to make sure you aren’t sensitive to them. Remember to store the tops and bottoms separately as the tops absorb moisture. The next time you are dicing up vegetables for a meal in the kitchen, remember to use the whole vegetable or save some of it for a delicious stock down the road. How do you cook your vegetables from root to stem? Share below in the comments!